What’s the one must-have item for retailers in 2016? Market share. Tesco, the UK’s dominant grocery chain, is pursuing a strategy of shoring up its share of the grocery sector, hoping to recover from a year that saddled its shareholders with a negative 25 percent total return. That involves some old-fashioned gorilla tactics. Tesco is still the biggest grocer in Britain, but its market share has fallen to a 10-year low. Market forces are why: years of high returns attracted competitors, from low-cost German supermarkets to U.S. e-commerce group Amazon. Sales figures reported on Jan. 14 suggest its market share is increasing again. Christmas sales on a same-store basis grew 1.3 percent compared to the previous year, where analysts forecast negative results. This time a year ago, Tesco’s quarterly sales were falling at a rate of 5.1 percent. Behind that result is another fact of market forces: cut costs and customers will come. On traditional Christmas goods like turkeys and stuffing, Tesco was 5 percent cheaper than its peers. Other factors help too, like having enough stuff on the shelves. But Tesco is sticking to its forecast for the full year of 930 million pounds in operating profit, which suggests higher volumes come with lower margins. That’s not a bad thing – retail recoveries must start with the top line, and scale is Tesco’s best weapon. But if margins are falling, Tesco will struggle to deliver its bigger goal of delivering increased value for shareholders. Its return on equity is likely to be just 4.7 percent in the year ending in February, according to Citi – far below what shareholders need to justify holding the stock. The grocer’s debt of five times EBITDA before rental costs, according to Barclays, is too high for a company that wants to maintain an investment-grade rating. More than its less-indebted rivals, Tesco’s investment case hinges on how fast it can reduce its leverage, which means increasing its cashflows. That could come from competitors conceding price-war defeat, more efficiency, or finding a palatable way to squeeze suppliers for a better deal. A valuation of nine times the next 12-months’ forecast EBITDA, almost a fifth above its 10-year average, suggests investors are hopeful. If Tesco can harness its inner gorilla, this could be the start of a comeback. Tesco’s sales over the Christmas period increased 1.3 percent in the United Kingdom, when comparing same stores with the year before – beating analysts’ estimates of negative growth, and the previous year’s 0.3 percent decline. The UK’s biggest grocer by market share said that group-wide like-for-like sales over the third quarter ending on Nov. 28 declined by 0.5 percent, compared with 0.3 percent in the previous three months. But including the Christmas period, growth was positive for the first time in four years. The quantity of goods sold increased by 3.5 percent, implying that prices fell by around 2 percent. Britain’s grocery market has been in a state of price deflation since mid-2014, according to data from Kantar Worldpanel. Analysts at Barclays had forecast a 2 percent like-for-like sales decline for the Christmas period at Tesco’s UK stores. Jefferies analysts had forecast a 1.7 percent decline. 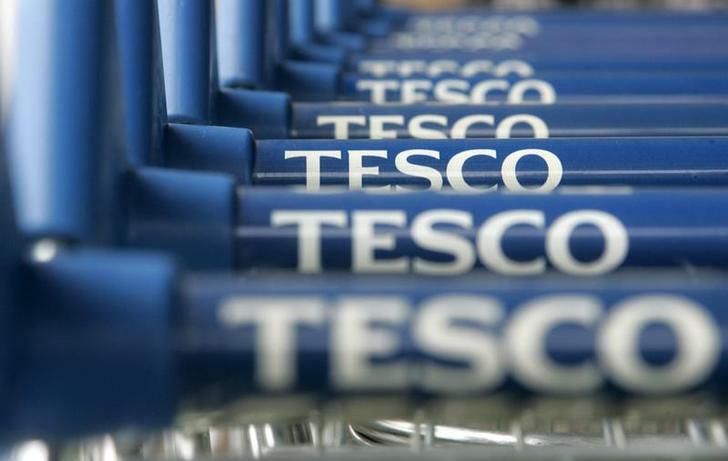 Tesco shares were trading at 166 pence at 1000 GMT, 4.9 percent above their previous day’s close. The stock has delivered a total return of negative 25 percent over the past year, according to Datastream.